Hello, everyone! 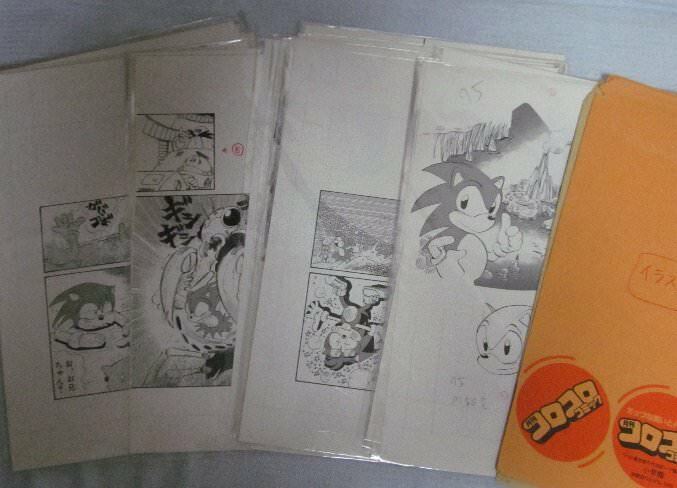 I have recently acquired a bunch of Shogakukan books containing stories for Sonic the Hedgehog and I've been really excited to finally show the scans I made of them for everyone! My two friends and I have been recently searching for these old books in order to scan and archive the Sonic stories in them and compile a complete collection of each grade of Shogakukan as well as for the Coro Coro Specials. If anyone is willing to help, we are in need of a translator for the scans, especially for the 4th grade novels. In addition, I have more books on the way and would greatly appreciate any donations to help continue our goal of obtaining the other magazines. (Please Direct Message me if you are interested). There are more scans of the books on the way to look forward to, so definitely be on the lookout for them later on! Thanks for scanning all of those SonicGenesis! Matsubara's art in those Shogaku Yonensei issues is fantastic! This is the first time we've seen his Sonic art. It's surprisingly on model with the Sega designs too. 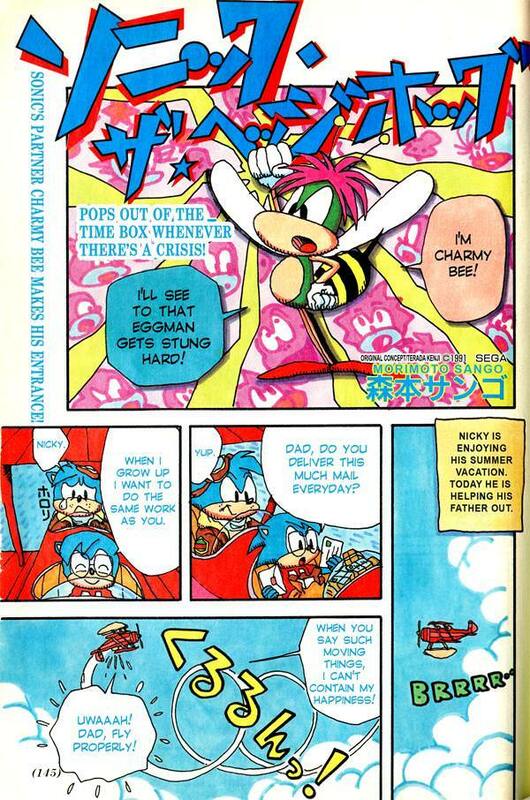 The May 1992 has what appears to be the very first appearance of Charmy Bee in any of the magazines, predating Sango Morimoto's interpretation of the character. It's very similar to his Chaotix appearance, but with a different nose and a pilot's jacket. Given how close Matsubara's art is to the recently uncovered concept art, it's probably safe to assume that this version of Charmy is in line with Naoto Ohshima's original design. 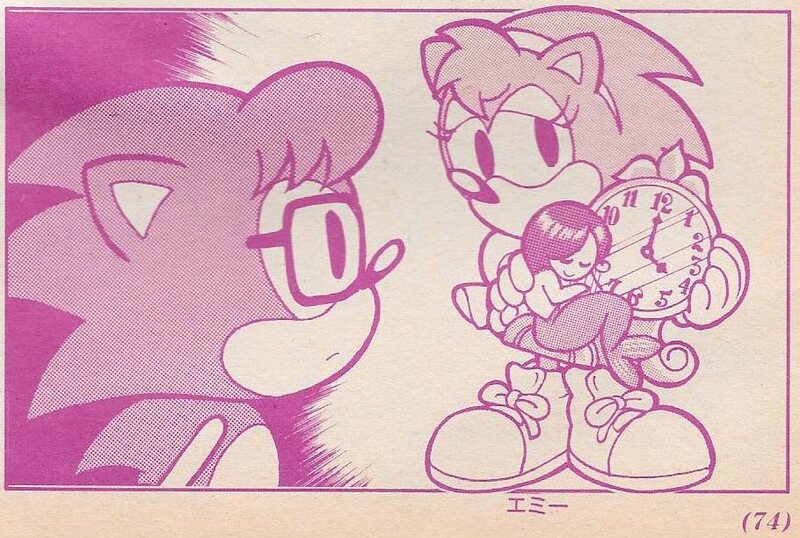 Amy in the July 1992 issue is very much in her Sonic CD form - she doesn't have the upwards flick of "hair" like in the manga concept art. It would be great to see this stuff translated at some point, the story looks pretty wild. What's the deal with the mermaid clock? And the wizard/witch? And the toy soldiers? Wow. Thank you for these, you're amazing. O.. M. . G. . . ! Thanks for the Amazingly awesome saucesome Scans SG89! This is great! Looking forward to more scans! Now, the most interesting issues are the 1992 Shogaku Yonensei issue that has another map version of Hedgehog Island and in a cowboy illustration you see a fox girl named Patty that looks a lot like Tails. There's also a little Sonic 2 section in it. The 1993 Shogaku Ichinensei has a Chaos emerald that comes out in it. And the summer vacation issue has an issue where it shows Eggman might know Nicky is Sonic and also shows that he has his own double identity by being a cop in Hedgehog town. Thanks for scanning all of those! There's some pretty interesting stuff here! * The map is gorgeous. It looks like there's a lot of lore there, if anyone wants to take a stab at translating it. * Patty and Monica - there was absolutely nothing online about either of these characters before! Patty is a fox and clearly based off of Tails, but did she appear in Yonensei before Tails himself did? Monica appears to be a mouse. * It's usually only the Ichinensei and Ninensei stories that are in color, so this full color bonus segment is a real treat. Sango Morimoto's Amy and Anita (named Tania in the other magazines) were both orangey brown colored, but here Norihiro Matsubara's Tania is pink and Amy is bright yellow! * And Charmy has tan legs and a green trim on his helmet. * Eggman's robot lackey is called Omelettes. He shows up in the later stories illustrated by Yoshihiko Ochi, so he must have been a recurring character. * Eggman is the villain of the main story. Is this the second story arc, or does it tie-in with the craziness of the earlier issues? * Oddly, Nicky doesn't appear in any of these last few issues. It makes me wonder if he ever appeared in Ichinensei, or if he was phased out? * Little John has a cameo in the last issue, so that cast was still around. * Tails' muzzle and tummy fur are correctly colored white. In Sonic the Hedgehog Book and the Sonic 2 Official Guide Book his fur was tan colored (an oddity seen in a lot of early Tails art and merchandise). * Sango Morimoto's Amy, on the other hand, is still orange-brown, and still as off-model as she was in his earlier issues! I picked up Shogaku Ichinensei May 1993 recently. Raw scans are on MEGA (pages 137 ~ 140) and compressed ones on my site. Great scans as always Ragey! Thanks for posting them! It's interesting how the Tails era of Ichinensei frequently has Eggman driving a red land-based vehicle. It's like Sango Morimoto saw the Emerald Hill Zone boss and figured that was Eggman's new gimmick. On a related note, scans of a two-part biographical manga on Hayao Nakayama were recently shared on Twitter. Their connection to this series? 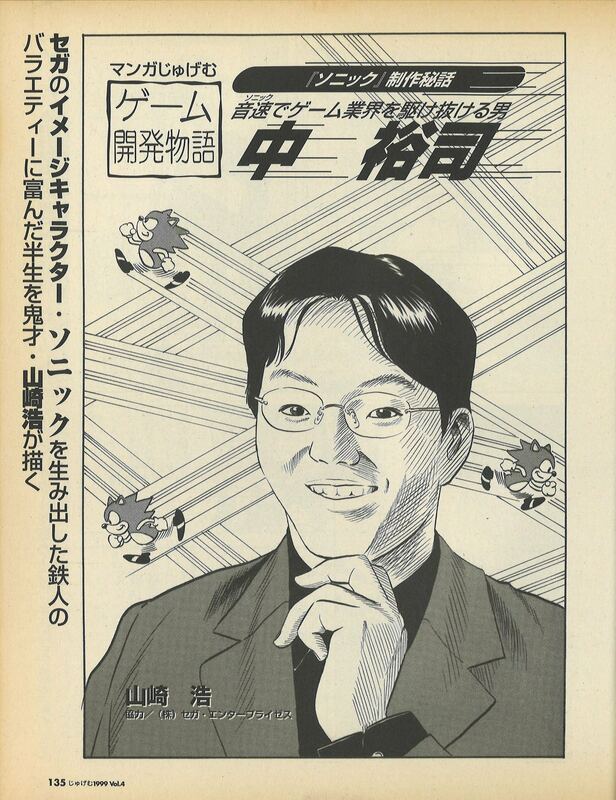 Sonic appears in both parts, and according to the NDL, they were published in the December 1992 and January 1993 issues of Shogaku Sannensei. Find me scans, put them on wiki, etc. etc. etc. I've recently acquired two more issues of CoroCoro Comic Special! The two issues are the Gekkan CoroCoro Comic Spring Break Special and the June 1994 issue which is the final chapter for the CoroCoro Comic series! I am very pleased to finally show everyone the two chapters that I've scanned. The final chapter to the CoroCoro Comic series is really interesting and also very dramatic! I was actually a bit surprised by how dramatic it was! I think that they ended the series in a really good way and it only made me want to see the other missing chapters all the more. There is a lot more issues on the way for everyone to look forward to so be on the lookout for updates very soon! I also made a Ko-fi page for anyone who is interested in helping out with acquiring more of the books that we need. The books themselves are very rare and hard to come by and I search for them everyday hoping to find something. Whenever a book does show up it's always very exciting and rewarding especially because I am filled with a lot of anticipation to see what each chapter holds. These books often vary in price but can become really expensive at times especially when there is competition involved but what really gets me a lot of the times is the shipping fees. If anyone is willing to help donate it would help go towards paying for both the books and the shipping. I really want to try and find every missing chapter from each grade level of Shogakukan and CoroCoro Special and scan them all in high quality so that they can be preserved and also so that we can all enjoy this series. I really adore the artwork and the stories and find them to be really interesting. A lot of main characters such as Amy, Charmy, and Vector make their debuts in this series and according to that Fantasy Factory video Sega and Sonic Team also had a lot of involvement in the creation of the manga characters and stories so I feel like this is an important piece of Sonic history that we should try to document and preserve. If anyone is willing to help donate I just want to say thank you so much and that it is really greatly appreciated! Awesome! Thanks a lot for sharing these! The final chapter to the CoroCoro Comic series is really interesting and also very dramatic! I was actually a bit surprised by how dramatic it was! Just saw it and WHAT THE F-OH MY GOD. You're right, this chapter has everything. Little Planet! Giant Metal Sonic mech! Evil mind-controlled Amy! Sonic getting his chest gorily drilled! Wait, what!? That mech piloted by Eggman and Amy reminds me of Eggman and Serah piloting Black Eggman in the OVA, I wonder if that idea was inspired by this manga storyline? Anyways, thank you for your efforts, SonicGenesis89! I think that deserves some spoiler tags in case that somebody wants to experience the wtfness without knowing in advance.